There are a lot of PC gamers and enthusiasts who are rather impatiently waiting for the next generation of graphics cards from the green team. Thus featherweight news snippets like Nvidia saying happy birthday to Alan Turing a couple of days ago, was seen as "GTX 1180 confirmed," by several news outlets. But Nvidia has a problem with current gen GPU stockpile returns, according to industry sources, and seems reluctant to launch next gen products in the current market - so 'Turing' remains on the far horizon with every new related news morsel we see. A few hours ago a photo of an Nvidia branded engineering sample graphics card was shared on Reddit, via VideoCardz. The nicely clear and detailed photo shows a card that is certainly in the early stages of its development and sans-GPU (a big GPU at that). However, there are a number of interesting pointers that this is indeed a recently put together next gen Nvidia card. The most striking evidence of things to come is the visibility of Micron GDDR6 memory chips. Mass production of these memory components was only announced yesterday. We know of no existing GPU that works with GDDR6. Nvidia could be working on a Pascal card with GDDR6 but that doesn't seem likely. We can see 12 of Micron's GDDR6 memory modules installed on this prototype card. As is often seen in engineering samples, the card is maxed out. 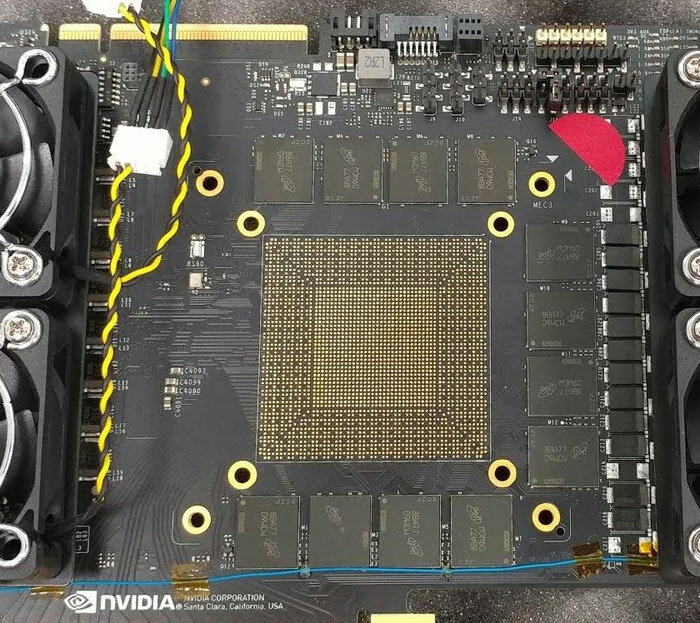 It has both an over abundance of things such as power connectors (x3) and an interface that looks like NVLink along the top. Embryonic graphics cards commonly boast these things so they can be tested at their limits and be monitored more closely than finished shipping examples. As VideoCardz concludes, this may or may not be the first photo of a 'Turing' graphics card. It could equally be a Quadro or a general test design. 1 Has Samsung been chosen for Intel Xe GPU manufacturing? Nvidia to publish open source version of Quake II RTX AMD's 50th anniversary will precipitate special CPUs, GPUs PC Specialist Vortex S1 Razer Blade 15 QOTW: How fast is the storage in your PC? Has there been any official roadmap from Nvidia mentioning Turing though? Like Ampre I think its just another spin from the rumour mill. With Volta having the biggest R&D budget yet, I am sure Nvidia will want to generate as much profit as possible from Volta, including the enthusiast and mainstream consumer markets… So my bet is that the next gen of GTX/RTX cards will still be Volta based, although Turing could be a die shrink of Volta…. With the stockpile of old cards/GPUs, I would be surprised if they didnt just drop them down a tier, slap a new badge on them and sell them for a few quid less. Right now the stocks of Vega cards seem pretty weak again pushing prices back up, so there isn't any competition for 1070 and higher cards. Nvidia can pretty much do what they want right now.